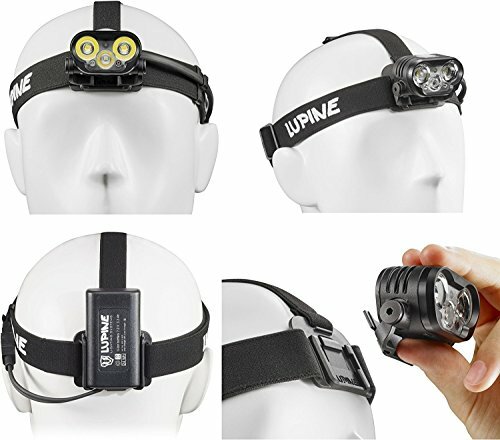 The Lupine Blika: Camping, Hunting, Fishing, Biking, Running, Climbing, Skiing: When developing the Blika, we asked ourselves what a lamp has to do to enable a broad spectrum of activities at night? Features: A fully adjustable spotlight (up to 2100 Lumens!) for fast journeys and challenging terrain; when you want lots of light and a broad, homogeneous illumination pattern. Integrated red and green lights that can be adjusted in steps for special applications requiring special lighting. Full control: access to all lighting levels and special functions in every situation. Diffused reading and camping light for those times you need 'less' light. FRONTclick quick-change system; turn your headlamp into a helmet lamp or swap your headlamp from one helmet to another in just seconds and without any tools (click into place onto the plate attached to your helmet with a special 3M adhesive pad or the tried and tested Lupine velcro system; additional mounts/ Velcro/ 3M pads sold separately) The Lupine FastClick System allows a change of batteries within a second. (additional FASTclick batteries sold separately) 2100 Lumens; 50g Lamp; 3.3 Ah FastClick Battery; Runtime 1:05 - 80 Hours; 250g Total System Weight SYSTEM INCLUDES: Blika 2100 Lumen aluminum lamp head, 3.3 Ah FastClick battery, headband with FrontClick and FastClick mount, Wiesel V4 battery charger, and Blika manual. Manufacturer: Lupine Lighting Systems GmbH. Publisher: Lupine Lighting Systems GmbH. Studio: Lupine Lighting Systems GmbH. If you have any questions about this product by Lupine Lighting Systems, contact us by completing and submitting the form below. If you are looking for a specif part number, please include it with your message.